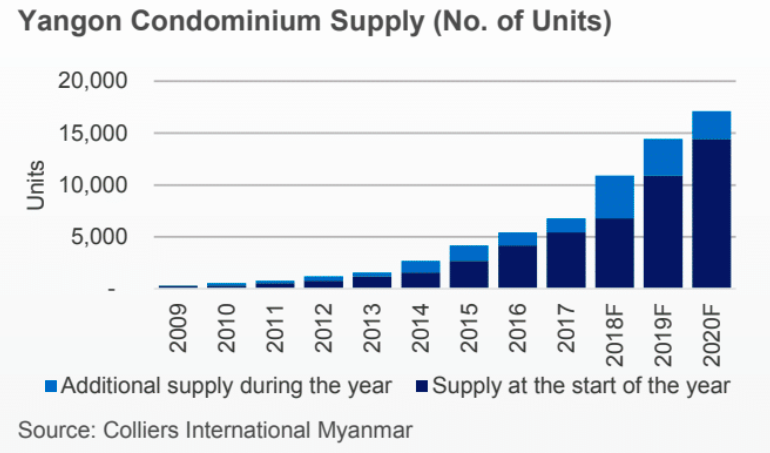 Colliers International Quarterly Review - Yangon Condominiums Q1 2018 report observed a modest increase in the citywide take-up rate caused by the slim volume of units launched in Q1 2018. Caused by the slim volume of units launched in Q1 2018, the citywide take-up rate observed a modest increase. While Colliers recognises these minor market improvements, structuring systematic and efficient reforms will further help the sector realise a more sustainable progress and regain the lost confidence of both developers and buyers. Demand: Demand for love to mid-tier projects remain untapped given the onerous car parking regulation. Providing clarity and reasonable amendments to the existing policies will bolster growth across the residential market. Supply: The total unit launches increased by 3% QoQ. By end-2018, Colliers anticipate the total stock to reach a new record high, with most projects to be situated in the Outer City Zone. Take-up Rate: Colliers recorded a 2.2% QoQ increase in the citywide take-up rate. Colliers expect the rate to realise a slight drop in the succeeding quarters given the surge or future developments in 2018. Selling Prices: Prices across all segments continued to trail downwards. Colliers believe that rates will become more competitive as supply builds up in the next three years. As of Q1 2018, Colliers witnessed a meagre increase in the total number of unit launches. Ayar Chantha Executive Residences by Chantha Shwe Myay Construction Co., Ltd., the only condominium project that launched this quarter, caused a 3% QoQ upturn in the overall condominium stock was recorded. The completion of Sky Villa by Shan Star, New Generation Engineering & Supplies Co., Ltd. delivered approximately 30 units into the total supply tally. 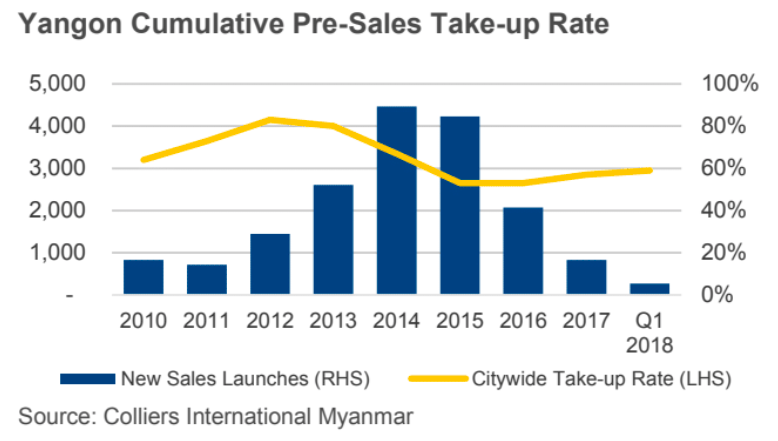 While Colliers recognises these modest numerical improvements, they observed that Yangon developers' view of the market remained generally low. Additionally, several projects that were announced to be unveiled within the quarter delayed their respective timetables or shelved some phases of their developments, owing to the underwhelming market sales performance. This scenario should strongly motivate developers to revisit their strategies and give their offerings an overhaul in order to ease buyers' reluctance towards the market. Looking ahead, the future stock appears likely to remain substantial with more than 10,300 units due for completion between 2018 and 2020. For the immediate year alone, Colliers expects the citywide stock to reach a new record high, with an annual addition of more than 4,100 units. Out of the 38 projects set for completion this year, 47% of which is situated in the Outer City Zone. Golden Parami Condominium by Shine Construction Co., Ltd.
Kabaraye Executive Residences by Living Square Co., Ltd.
Golden Rose Condominium by Dado Construction Co., Ltd. These new developments collectively represent more than 360 units. Meanwhile, Colliers expect 29% of the aggregate Q2 2018 supply pipeline to be introduced in the Inner City Zone. Changes and revamps to the regulations governing the property industry have been one of the accentuated focuses over the recent years, as Myanmar pursues to deliver its real estate and construction codes at par with international practices. While progress has been made, Colliers believes much remains to be done in this area, with 2018 likely to see further legislative efforts. One key legal reform that took place in the country was the passing of Law No. 24 of 2016, known as the Condominium Law. It aims to update and clarify the legal framework governing condominium properties. Accompanying Condominium Rules were published by the Ministry of Commerce (MoC) in December 2017 to further illustrate how the law would be applied in practice. Under the new rules, foreign buyers can now acquire up to 40% of the total floor area of a condominium building. Another provision is that foreign investors and entities are now eligible to become joint developers of a condominium, although several requirements must first be met including the procurement of permit or endorsement from Myanmar Investment Commission (MIC), gaining approval from relevant management committee, and being in possession of a formal agreement with the developer. Lastly, the new rules provide greater safeguards for property buyers. The regulations place a number of restrictions on developers by codifying terms for off-plan sales. Central to this is a requirement that developers can only pre-sell units after 30% of the foundation has been completed, a measure aimed at providing increased protection to unit purchasers, while also allowing developers to generate the cash flow needed to finance ongoing projects. Given the meagre increase in total stock and unit launches, the cumulative citywide take-up rate witnessed an increase of about 2.2% from Q4 2017's 57%. As for the selling prices, it further trailed a downward path. In fact, as at the end of Q1 2018 weighted selling prices in Yangon ranged between USD$1,458 and USD$2,958 per square metre per month, from a midmarket to a luxury category. While prices continued declining over the past quarters, the amount remains substantial. By and large, there remains a widely untapped demand for low and mid-tier segments. But because of the requirement for condominium projects to provide 1.2 parking spaces per unit, developers are forced to build larger units. This key barrier is currently making condominiums an unprofitable development, yet such structures are also key to the expansion of the residential market, making the provision of further regulatory reforms essential for the segment to continue moving ahead. Click here to view Colliers International Quarterly Review - Yangon Condominium Q1 2018. For more information or to discuss the report, email Karlo Pobre or Paul Ryan Cuevas of Colliers International via the contact details listed below.